Kids (and parents alike) will enjoy the bird's eye view at Eureka Sydeck. Image courtesy of Eureka Skydeck. 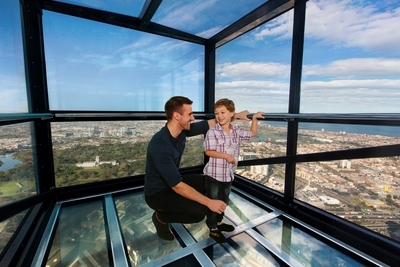 For an unforgettable view of Melbourne, kids and parents alike are sure to enjoy the Eureka Skydeck. Located beside the Yarra River in Southbank, the Skydeck is a popular attraction for both tourists and locals. Offering views from 88 Levels above ground this is the highest viewing platform in the Southern Hemisphere at 285 metres above the ground. Following a quick 20 second elevator ride to the top (watch for your ears popping! ), you'll get a panoramic view that's amazing both day and night. 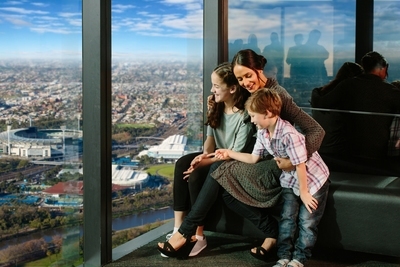 Family passes are available for $44 and from the top of Skydeck you'll find 30 viewfinders to help discover the icons across the city from the MCG to to the Dandenong Ranges. LED information displays projected across the floor point to key landmarks including The Royal Botanical Gardens, Flinders St Station and the Shrine of Remembrance. For older or more adventurous children, try the Edge experience. Image courtesy of Eureka Skydeck. For older children, or the adventurous types, the Edge experience is the world's only 3 by 3 glass box which slides out from the building allowing participants to see the city views from under their feet. Photos are available to share the memory later. Eureka Tower has a kiosk at Level 88 with takeaway coffee, soft drinks, beer wine and snacks. There's also a gift shop on level 1 for souvenirs and the like. Tickets for Eureka Skydeck can be booked online and tickets emailed for a quick and convenient experience. Eureka Skydeck operates from 10am to 10pm daily (last entry 9:30pm).